BEING Hitched With EL and AR: STD's... the good kind. We started putting ours together around mid to late January-early February-ish. 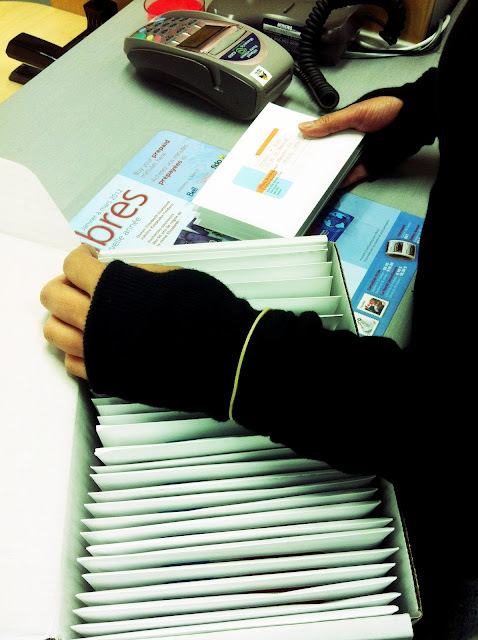 We sent out the first batch around the beginning of March and two came back with the wrong address. Those have now been mailed along with some other ones for people who we had to bug for mailing addresses... ahem. 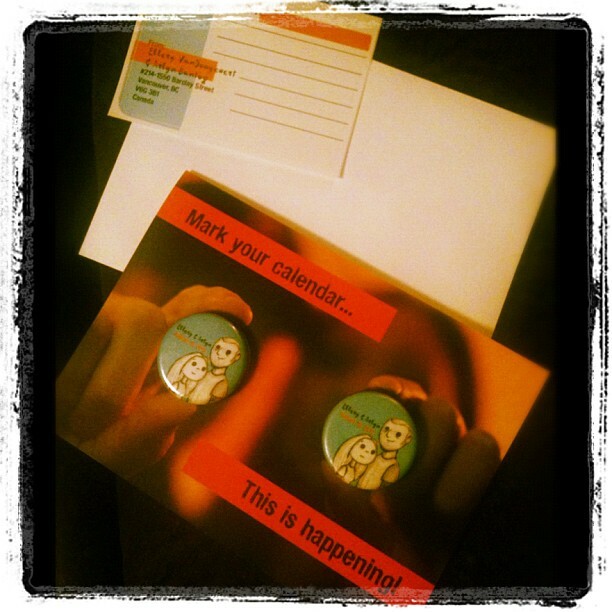 So now with only one straggler left to mail, I figured it would be okay to post about our Save-the-Dates. Ellery did the drawing, which I really like despite his self-deprecating comments about his drawing skills. (Really, it's super cute.) He still wanted to tinker around with it but we had a deadline and if I didn't pull it from him he would still be drawing it now. We knew we wanted magnets but the concept for the cards was still up in the air. 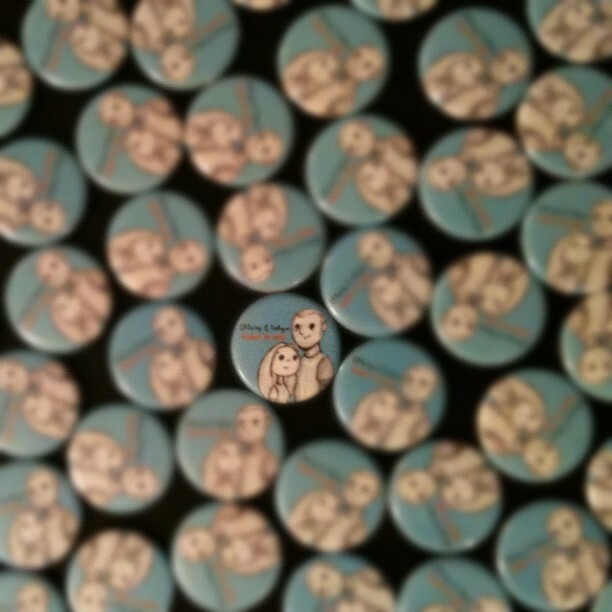 We had the buttons made by Chris at This is Plan B, the guy who makes the buttons for the Button Show. He made them without the pin backs and we got some heavy duty magnets from Urban Source and glued them to the back. I got the concept for the cards from some Valentines posted on Pinterest except instead of lollipops, we used the button magnets. The trickiest part was getting the photo right using a tripod in lieu of a trained photographer. This was rough since it was getting pretty late in the evening and I really wanted to get our order into MOO before their sale ended. Once we had a photo we were happy with, I did a little bit of designing in Photoshop and ordered our cards with about an hour to spare before the sale closed. 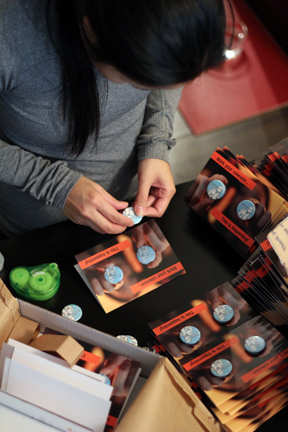 Within a few weeks our buttons were ready for pick up and our cards showed up in the mail. Then the assembly line started. After the task of gluing 200 magnets to 200 buttons was done, there came the task of gluing the 200 button magnets to 100 cards. I used the non-permanent glue dots that come in a roll. It went quickly once I got used to the dot dispenser. At first the dots rolled off like little boogers but once I got the hang of it, they were coming off nice and flat. Here are some photos of part of the process. This was the box of Save-the-dates I brought to the Post Office. And this concludes my first post on our wedding blog.